I can totally understand a person’s obsession with shiny gadgets. How can one not be distracted by something shiny that does nifty things? Even pico projectors, which I don’t think I have a need for, can be an attractive purchase – if only just because. This limited edition pico projector from Personal Projector UK is something else, though. It is encased in 24 carat gold, which should already give you the idea that it does not come cheap. Described as the ultimate luxury gadget, the package includes cables (HDMI cables as well). At GBP999 (about USD1600), I get how it can be the ultimate luxury. To be fair to the manufacturer, the pocket projector does have its highlights. It has received a design award from CES Innovations 2011 Design and Engineering Awards. It also has been reviewed by BBC’s Something for the Weekend and was described as having “really incredible quality”. (Now for that price, nothing less than incredible quality will do, don’t you think?) The manufacturers also highlight the fact that this pico projector can be connected to practically any device that you own. 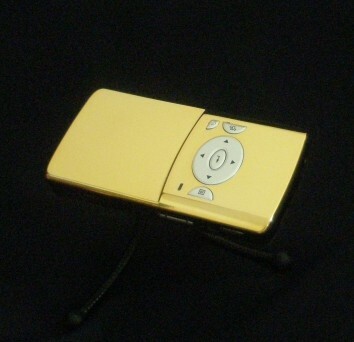 Flip, smartphones, digital cameras – name it and the iGo LED Pocket Projector will be able to connect to the device. The result? You can project whatever pictures and movies that you want to show off wherever you may be. Oh, if you are from the UK, you can get a FREE 30 Day Subscription to LOVEFiLM + a £10 Amazon.co.uk Gift Voucher. Thank God for small favors, eh? Still, if money is not an issue, this gadget will be an interesting conversation piece if anything. Buy it here.